CareerOneStop’s Occupation Profile has always provided accurate and up-to-date details on a wide range of careers—nearly 1,000 in all. 1) How do I find out what this career is really like? Read an occupation description and overview. See a list of typical tasks that workers do on the job. 2) What’s the outlook for jobs in this career? 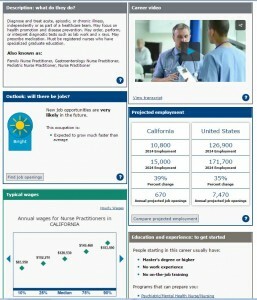 Find out if a career is expected to be in demand—that is, have many job openings in the future. See detailed data on projected employment growth or decline. Link directly to local job listings. 3) How much money could I earn in this career? See the typical wages earned by workers in this career. Compare salaries for nation, states, or your local area. 4) How much education or training would I need for this career? See the range in education levels of people working in this career. See the typical education for starting out in this field. See the amount of work experience most people have when starting. See the average level of on-the-job training. Link to local training programs that can help you prepare for this career. 5) Is this career a good fit for my interests, skills, and abilities? See a list of personal interests that are typical a good fit for this career. Learn about the abilities and personal qualities that are usually needed for this career. See a list of work-related skills that are most commonly required for jobs in this career. ‹ Thank a teacher, be a teacher?